Today I finally had a few hours to spare and spend my holiday gift cards for the drugstore. So, I decided to share what I got, because I did tell you about what I wanted to get. Click if you want to see My Shopping List! I’ve found most of the things from the list, and I actually got even more than I expected, so that’s cool! First I want to apologize to all of you for not being very consistent in my writing, but also to all of my blogging friends out there. I haven’t been visiting your blogs, or even replied to your comments in quite a while… I am really sorry, but I promise to start doing that from Monday! 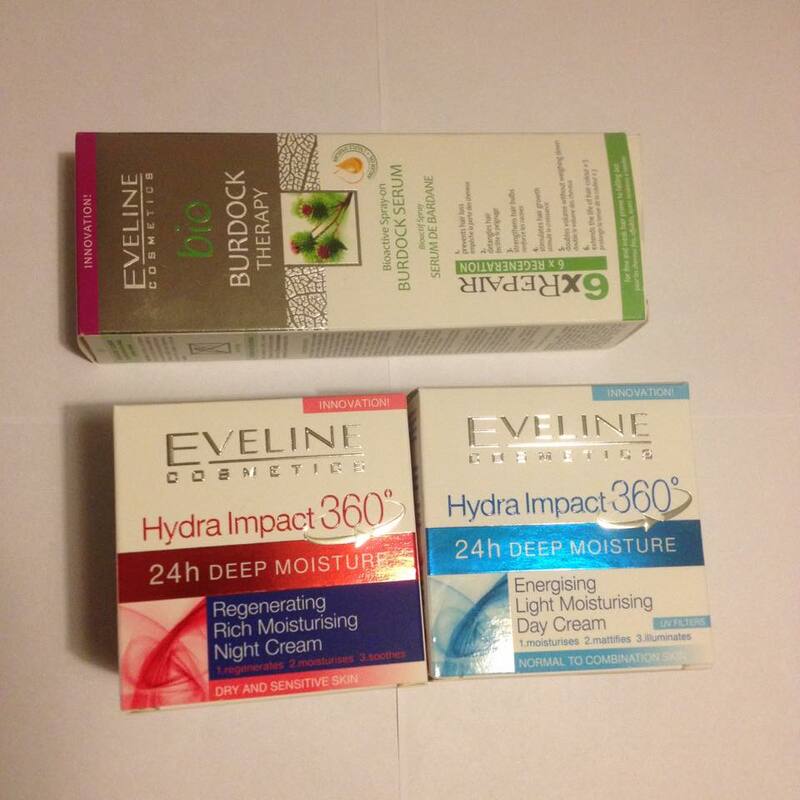 I got three things from Eveline Cosmetics. The first two are moisturizers, a day and night cream with Hydra Impact formula. 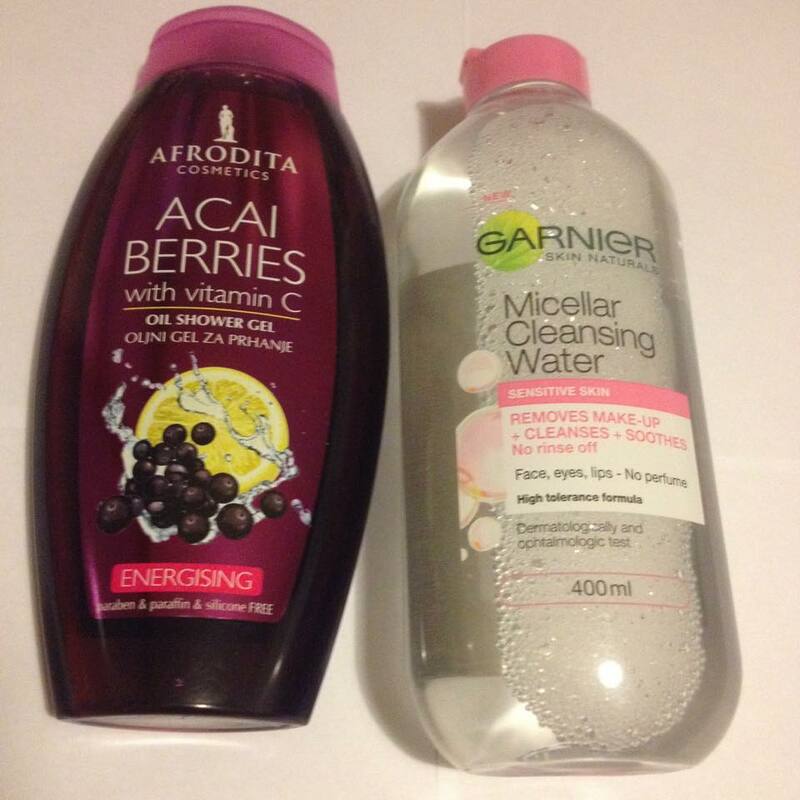 I have already used a product from that line and I love it, so I wanted to try our more of them. I will do a review (or write about these in my favorites) soon. These products were around $4 each. Cool, right? The third product from Eveline is a Bio Burdock therapy Serum that prevents hair loss, detangles hair, strenghtens hair bulbs, stimulates hair growth, doubles volume without weighing down and extends the life of hair colour three times. My hair has been falling out like crazy, so I decided to try it out, and for only around $2 you get 150ml product. I can’t go shopping without buying some nail polish. I know, I have about a hundred nail polishes at home, but there’s always a color I don’t have, or an effect nailpolish I don’t have. Plus, I really needed a yellow one 😀 So, I got one polish by s.he stylezone in 300, which is a cool yellow color. This was just under $3. 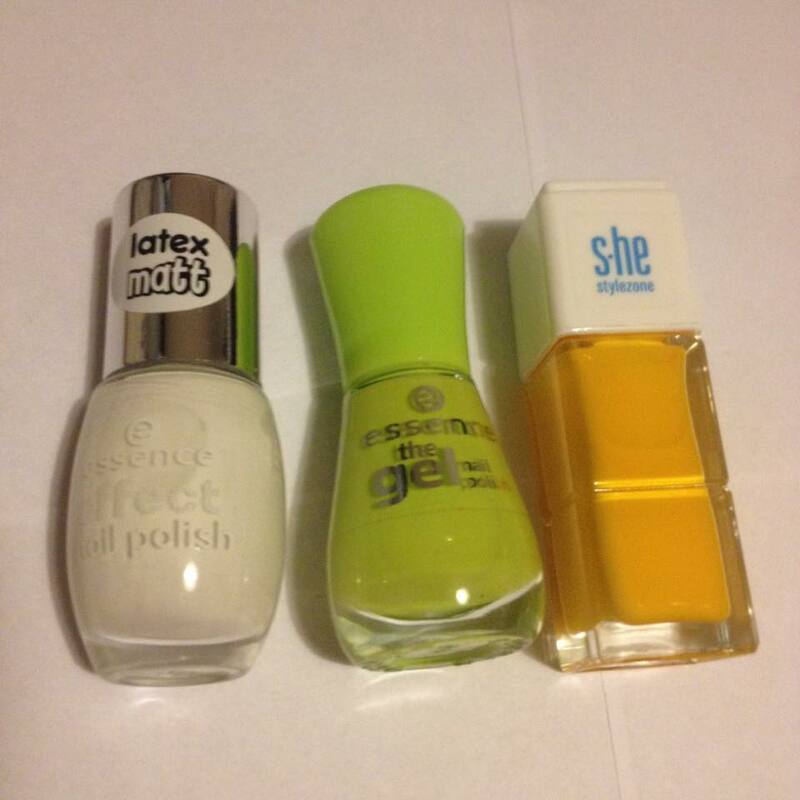 The other two are Essence nail polishes, and they were for under $1.5 each (they were on sale, which was quite cool). One of them is a latex matt Essence effect nail polish in 37 the white bunny and the other one is a cool green Essence the gel nail polish in 27 don’t be shy! Next I got my favorite eyeliner, which was my top priority, since mine is almost empty. It’s Alverde Naturkozmetik eyeliner in 01 schwarz. It was a bit over $3. Also, S.he stylezone eye shadow base. 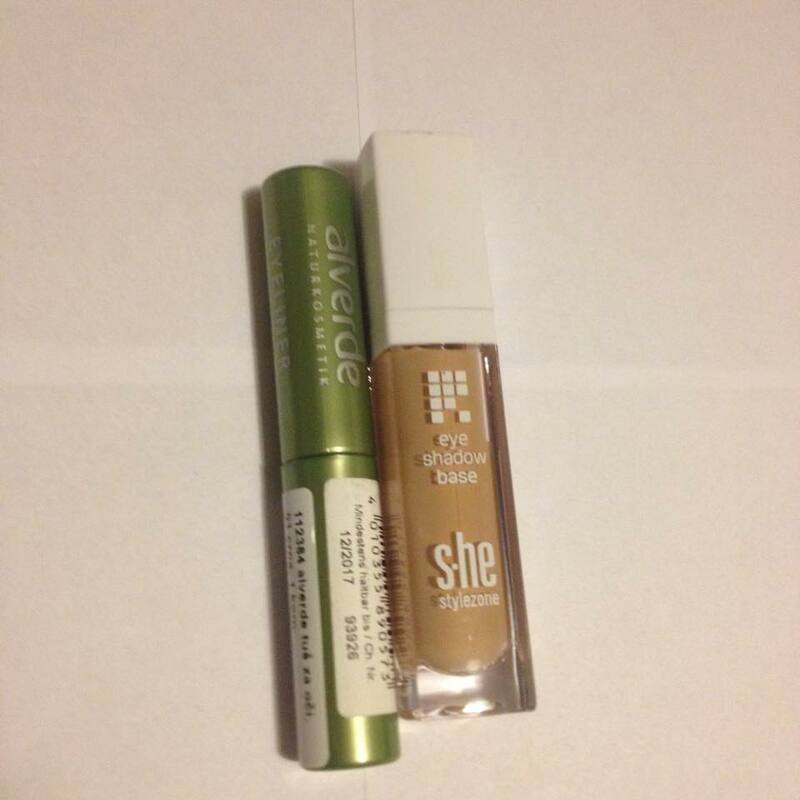 I have one by Makeup Revolution, but it’s nearly empty, so I needed a new one, and I will be able to compare the two 🙂 This was also a bit over $3. I’ve had my micellar water for over a year now (yes, I know it’s expiration date is 6 months after opening), but you really don’t need a ton of it, and it’s a 400ml bottle. I can’t use it up in 6 months. I’m starting to go off topic here… My point is that I’ve been using it a bit more than just on weekends lately, so it started to go more quickly. That’s why I got a backup, because I don’t think I could live without it, to be honest. This was around $5.5. The last thing I got was this shower gel by Afrodita Cosmetics. I really wanted to get a Green Tea one, which you can see on My Shopping list, but they didn’t have it, so I went with Acai Berries with vitamin C. I guess we’ll see how it works. This was around $2. And that’s it for my haul! I didn’t really find everything I wanted, but I guess I’ll have to do more shopping soon 😀 Have you tried any of these products? Do you like them? Which one would you like to try?